Kilter will send an experienced and trained technician to your home who will thoroughly inspect your residence and make recommendations. We can also discuss our advanced termite treatment method, which, unlike most other companies, does not involve noxious fumes. Instead we use the KILGUARD system, which targets infestations directly. This means that you can remain in your home throughout the treatment process. And you can rest assured that our treatment service will be effective, as we back it with a two-year warranty. Don’t delay. Contact Kilter Termite and Pest Control today to schedule a free termite inspection in your Hermosa Beach, CA, home. 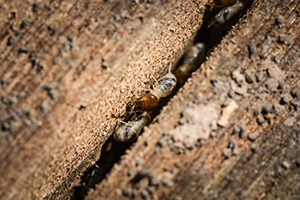 If termites have already caused damage in your home, also ask about the wood replacement services we can provide.